This past winter, Canadian progressive house music artist and owner of epic personalized license plate collection Joel Zimmerman (better known as deadmau5), has been busy piecing together a car collection that’s not in any way similar to your average celebrity’s garage. I say this because your average celebrity garage consists of a flat black G-wagon out front, with a smoked tail lights Lamborghini Murcielago and a Bentley Conti GT on 26” Asanti dubs hiding in the garage - both cars which are so out of style and so far down the depreciation curve, that it's cheaper to just kind of forget that they're there. But I digress. Joel's not your average celebrity. He doesn't just wake up one morning and leases a Rolls-Royce Wraight to take a selfie while standing on the hood. No. Not at all. Yesterday, Joel went for a drive in his new P1 McLaren. That’s right, he just took delivery of a classy blue P1 McLaren that's optioned out with every bit of carbon fibre available to spec - and a white on black interior (jury's out). You’d think he’d be over the moon, and, well... he is, but this wasn’t even the only Macca he bought in the past 12 months! 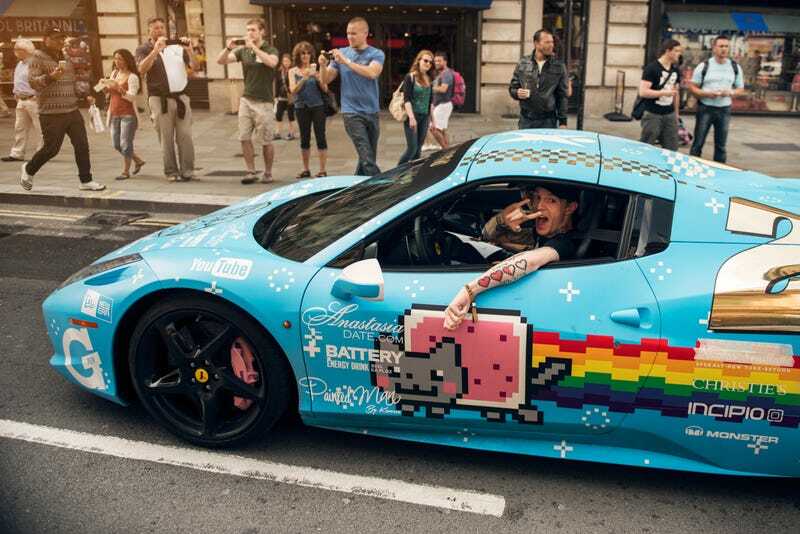 When he finished the 2014 Gumball 3000 last May, he was forced by Ferrari to unwrap his Nyan Cat Purrari and remove his custom “Purrari” badges. Joel, not one to back down from a fight (seen here successfully defending animal rights via the interwebs), gave Ferrari the big middle finger by way of picking up a brand new McLaren 650S dubbed ‘MeowClaren’. Good times. Fast forward a few months, and he’s now having fun in his own P1. Seeya never, Ferrari. But his stable isn’t just a one trick McLaren pony. In the past two months he’s picked up two other monsters - and there’s yet another on the way! How does he do it? I’m not exactly sure. Maybe he's literally just living everyone's dream. He's worked hard, he's created the world's best driving music, he made buckets of money and now he's kind of just,... doing what he wants. The real mystery is how I've already managed to sneak in 8 of his song titles. If you can find them all, the reward is cheese. A completely custom to Joel BAC Mono. Him and friend / fellow Gumballer / Ferrari Corsa racing driver / Entrepreneur / Team Wolfpack’s Josh Cartu decided they each needed a custom BAC Mono at some point last year. So they got some. While Josh smashed his in a Budapest tunnel, Joel’s is still very much in tact. Don't feel sorry for Josh, though, he's got a Ferrari 458 Speciale A to play with. And an F12. And a Rolls-Royce Phantom. And presumably, a new BAC. Joel ordered up a custom Jeep Wrangler Rubicon from Divine 1 Customs back in November and it was delivered just a little while ago. Apparently no expense was spared. Looks are subjective and I don't personally have had any positive experiences with Jeep products, but damn does that look the absolute business. Move over Purrari, the Purrari 2.0 aka Purracan is on it’s way to erase that bad Ferrari taste out of Joel’s mouth. Custom factory ordered badges and everything. That’s how Lamborghini plays. Speaks volumes about the differences between the two Italian makers. So what else is in the garage? Joel also runs a 991 Carrera S Convertible while his girlfriend messes about in a Bentley Continental Supersports Convertible. Why they have so many convertibles while living in the country in Ontario, the place that gets winter 10 months in the year and mosquitos for the two other months, beats me. But hey, let’s all raise our weapon and faxin berlin, because the reward is cheese and infra turbo pigcart racer. Something also tells me the 991 is out (gut feeling), and that the P1 is about to get wrapped and customized (see tweet below). All we know is, he’s one cool dude. I'm excited to meet him on the 2015 Gumboil 3000. If anyone else wants more proof that Joel seems like an awesome guy to kill some time with, watch one of his famous "Tim Hortons Coffee Runs" with Toronto mayor Rob Ford squished in his old Ferrari 458. You can't write this stuff.